당나라의 실차난타가 번역한『화엄경』주본 80권을 고려 현종 때 목판에 새긴 초조대장경이다. 권67·77의 2권을 닥종이에 인쇄한 목판본으로 종이를 이어붙인 두루마리 형태이며, 2권 모두 표지와 첫째장·본문 등이 약간씩 없어졌다. 제목 아래 ‘신역(新譯)’이란 표시가 있어 이 책이 주본임을 알 수 있다. 책 내용은 선재동자(善財童子)가 53인의 고승을 찾아가는 구도의 과정을 설명한 것이다. 초조대장경은 거란의 침입을 막기위해 판각된 우리나라 최초의 대장경으로, 해인사대장경보다 글씨가 힘이 있고, 새김이 정교한데, 매 행(行)의 글자수가 14자로 해인사본의 17자와 분명하게 구분되는 특징을 지닌다. 간행기록이 없지만 종이질이나 인쇄상태 등으로 보아 11세기에 간행된 것으로 추정된다. Daebanggwangbul hwaeomgyeong is also called Hwaeomgyeong (Avatamsaka Sutra) for short. Based on the basic ideology asserting that Buddha and all creatures are one rather than two separate entities, it is a fundamental sutra of Hwaeom Order; it greatly influenced the establishment of Korean Buddhism along with Beophwagyeong (Lotus Sutra). 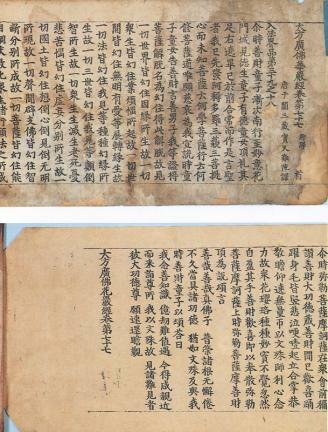 It is an early wooden Tripitaka made during the reign of King Hyeonjong of the Goryeo Dynasty by engraving the 80 volumes of Avatamsaka Sutra of Zhou version, which were translated by Silchananta of the Tang Dynasty, on wood blocks. 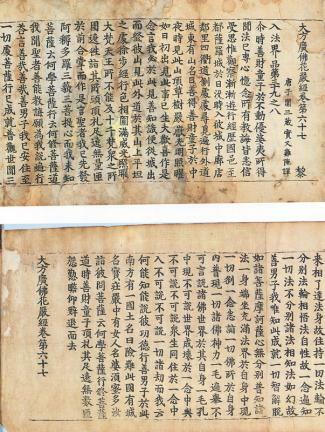 Volumes 67 and 77 are printed on mulberry paper. The printed papers are pasted successively into a long paper so that they can be rolled into one scroll. Both volumes do not have the cover and part of the first page and the main text. The “New Translation” mark under the title shows that this book is the Zhou version. The content of the book describes the process wherein Sudhana seeks enlightenment while visiting 53 great monks. The First Tripitaka Koreana is Korea’s first Tripitaka engraved to prevent invasions from the Khitan. 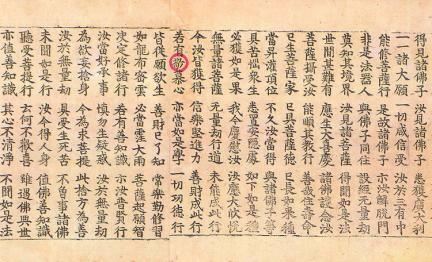 The style of calligraphy looks stronger and more vigorous compared to that of the Tripitaka Koreana at Haeinsa Temple. The engravings are intricate, with each line consisting of 14 letters unlike Haeinsa Temple’s Tripitaka, which has 17 letters per line. Based on the quality of paper and state of printing, this book seems to have been published in the 11th century.